Growth Hormone peptide fragment 176-191, also known as HGH Frag 176-191, is a modified form of amino acids 176-191 of the GH polypeptide. Investigators at Monash University discovered that the fat-reducing effects of GH appear to be controlled by a small region near one end of the Growth Hormone molecule. This region, which consists of amino acids 176-191, is less than 10% of the total size of the GH molecule and appears to have no effect on growth or insulin resistance. It works by mimicking the way natural Growth Hormone regulates fat metabolism but without the adverse effects on blood sugar or growth that is seen with unmodified Growth Hormone. Like Growth Hormone, the hgH fragment 176-191 stimulates lipolysis (the breakdown or destruction of fat) and inhibits lipogenesis (the transformation of nonfat food materials into body fat) both in laboratory testing and in animals and humans. Laboratory Tests and Fat Loss In laboratory tests on fat cells from rodents, pigs, dogs, and humans, the hgH fragment released fat specifically from obese fat cells but not from lean ones, reduced new fat accumulation in all fat cells, enhanced the burning of fat. In rodents (rats and mice), hgH fragment reduced body fat in obese animals but, enhanced fat burning without changing food consumption or inducing growth (as it does not increase IGF levels) or any other unwanted Growth Hormone effect. Research dosages of 500mcg of the hgH fragment 176-191 daily for 30 days did show a reduction of body fat in the mid abdominal area in both obese, over-weight, and average built people. Fragment 176-191 as an Active HGH Truncated Peptide hgH fragment 176-191 is an analog of the growth hormone-releasing factor (GRF) which signals the effects of growth hormone. It is a 15-mer peptide residue of the C-terminus of HGH to which tyrosine is added at the N-terminal end. This synthetically produced hormone is very common to weightlifters and bodybuilders because of a number of physical benefits. Studies claimed that it actually acts on the reduction of excessive adipose tissues such as those in the abdominal area, increase in muscle mass, and enhances the lipid content of the body. These segments of the synthetic peptide hgH 176-191 have been investigated for their in vivo effects in laboratory mice musculus. Research results have shown that hgH 176-191 have resulted to a short-period increase in blood glucose and a more sustained increase in plasma insulin, together with other fragments such as 172-191, 177-191 and 178-191. In addition, the researchers have suggested that functionality of the peptide depends not only in the informational sequence but should also have the correct physical configuration (Ng and Borstein 1978). Also, this fragment, being a region of high accessibility to proteases and also rich in proline, have been demonstrated to affect the conformational change in the cytoplasmic domain of the band 3 of erythrocyte membrane protein by serving as the hinge for the pivoting of the two subdomains. This then suggest that such residue is significant in conformational changes be serving as sites for peripheral protein binding in some body cells (Low et al. 1984). In another study of Ng et al. (2000) on animal subjects, they found out that a 500mcg dosage of the said hormone increased the lipolytic activity in adipose tissues without having negative influence in the blood glucose level. Furthermore, though it behaves like a human growth hormone (hgH), it does not causes hyperglycemia because it does not compete with hgH receptors (Wu et al. 1993). Because of such effects, researchers have suggested that it might be used for the elimination of excess abdominal fat which is a significant aspect of HIV-associated lipodystrophy. 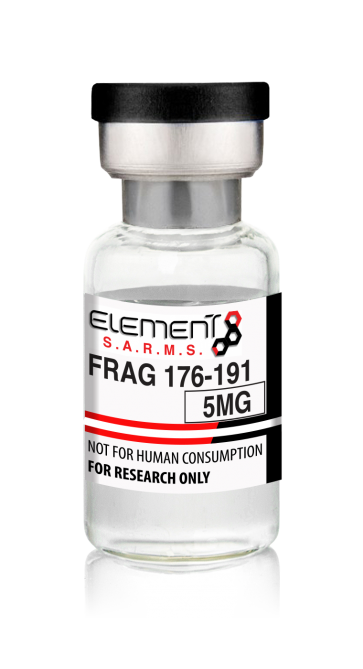 The (hgH fragment 176-191) exhibits the ability to burn through stubborn adipose tissue, while increasing energy expenditure, muscle mass, and fat oxidation. All studies have pointed to the fact that the fragment is an effective treatment for obesity and fat loss, and much safer than its Human Growth Hormone counterpart. No comment... Clomiphene has 5 stars from me. I will never ever buy from somewhere else.You are great.